As soon as I got home, I looked up a weaving draft for monk’s cloth and I found that there’s a 4-shaft weaving pattern available. After consulting a punch needle teacher, the cloth is essentially a simple basketweave pattern. I could do that on any of my little looms! This whole process became far more portable. Cotton Rug warp – any color. Punch needle – mine is an Oxford Punch. Warp the loom using the yarn doubled. When warping the Zoom Loom with cotton, it’s important to leave the warp a little slack. Because cotton is not very stretchy, the warp will get tight very quickly as you weave. This can cause some wrist or hand strain if it is warped too tightly from the beginning. Weave in plain weave using the yarn doubled. Once woven, leave the fabric on the loom, and push it down the pins until it is resting against the frame of the Zoom Loom. I chose to work from the back side of the loom so I could avoid hitting the pins with my knuckles. First, I drew a “map” or cartoon on the back to determine which colors were going to go where. MC = Multicolored, B = Blue. To get a nice dense pile, I made sure to punch needle into every hole. This also helps keep all of the loops in the fabric. By holding the edge of the loom with my hand, I was able to turn the piece any which way I needed to. If the pins bother your hand, you can always cover the pins with a piece of leather or use a glove to protect your hand. Once I finished the punch needle portion, I removed the square from the loom.Then, I soaked the square in hot water to shrink the cotton fabric, and lock in the loops more tightly. I’m excited to try this technique with my other looms, and make larger projects! I imagine that this would be a great technique for making a bath mat. We’ve taken a simple design and transformed it into an efficient and comfortable little loom. If you’ve ever woven on a pin loom, you’ll love our new and improved model. 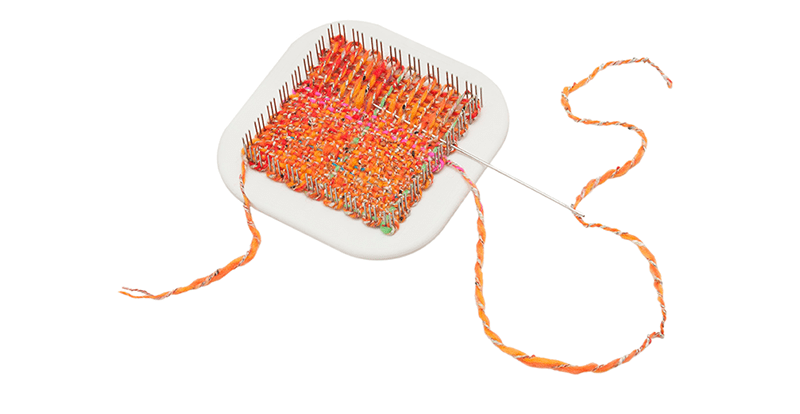 Small and compact at 4″ x 4″, the Zoom Loom is easy to take with you. Weave anywhere, any time. The Zoom Loom comes in an attractive carrying case. A 6″ weaving needle and a 3″ yarn needle are included, as well as a full-color instruction book with three projects. An instructional video is available online here. Check out our new 50th Anniversary Schacht Gear – Click the “Buy Now” button to snag some limited edition merch!